Paul Goerg is co-op located in the famous Côte des Blancs region of Champagne, famous for their Chardonnay, and owned by 7 winegrowering families. No surprise that their wines are Chardonnay dominated. They use low dosage and sustainable, environmentally friendly growing practices. The name comes from Paul Georg who became mayor of Vertus in 1876, and who was proud of the surrounded vineyards and involved with the local wine growers. In 1950, a group of wine growers with roots in Vertus first banded together, and in 1984 changed their name to Champagne Paul Georg. Vertus is the largest village in the Côte des Blancs, and home of producer Duval-Leroy. The grapes come from 120 hectares, mostly on land surrounding Vertus. The vineyards around Vertus are both south facing, producing "rich and supple" wines, and east facing producing rigorous wines with lots of minerality. They have a good French and English language Web site. Paul Goerg Blanc de Blancs - 100% Chardonnay, aged 3 years before disgorgement and 4-6 months afterwards with 8-9 grams/Liter dosage. Paul Goerg Absolu - Similar to their Blanc de Blancs but withe zero added dosage (sugar). Paul Goerg Brut Traditional - 60% Chardonnay, 40% Pinot Noir, aged 3 years before disgorgement and 4-6 months afterwards with 8-9 grams/Liter dosage. Paul Goerg Brut Rose - 85% Chardonnay, 15% Pinot Noir, aged 3 years before disgorgement and 4-6 months afterwards with 8-9 grams/Liter dosage. They suggest it with a roast leg of lamb and I can see that for sure! See the Tasting Note below. 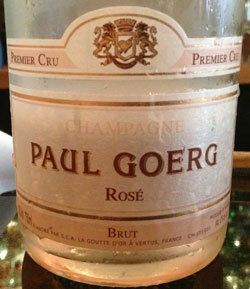 Paul Goerg Millésime - Interestingly a Blanc de blancs, i.e. 100% Chardonnay, aged 5 years before disgorgement and 4-6 months afterwards with 7-8 grams/Liter dosage. Paul Goerg Cuvee LADY - Their Tête de Cuvée. 85% Chardonnay and 15% Pinot Noir from carefully selected plots including Verzenay for Pinot Noir. It is aged 6-8+ years before disgorgement and 4-6 months afterwards with 7-8 grams/Liter dosage. Drank at Morrell Wine Bar in New York City. Not much on the nose - a touch of red fruit and some minerals with coaxing. On the palate it is very fruity and soft with a good supporting backbone. Raspberries and frozen strawberries. Very sensual. Absolutely a fun wine indeed!